When household appliances start running amok in the tri-state area, it’s up to one fearless duo to save the day. Can you stop the dastardly Doof once and for all? 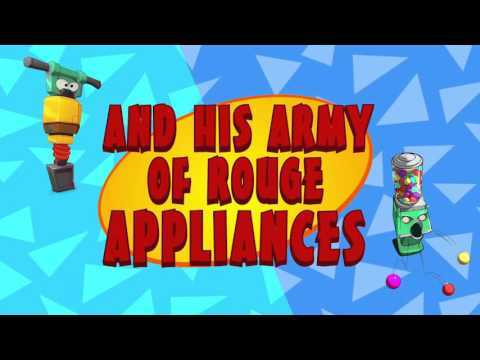 Take control of Disney’s Phineas and Ferb and rescue the city of Danville from a marauding army of… household appliances? That could only mean one thing, right? Yes, the dastardly Dr. Doofenshmirtz’s latest wacky scheme has gone awry. Everyday gadgets of the tri-state area are now springing to life and causing chaos in the local neighbourhood. It’ll be up to you to guide boy-geniuses Phineas and Ferb and their friend Perry the Platypus through an epic adventure to save the city. Use the touchscreen and camera to tackle everything from bad-tempered toasters to manic microwaves. Can the whiz-kids end the robot rebellion and stop Dr Doof once and for all? Find out in Phineas and Ferb: Day of Doofenshmirtz, exclusive to PS Vita. Buy Phineas & Ferb: Day of Doofenshmirtz on PS Vita.